The school is truly a family affair and you will usually find a Mejias in the building if you come to visit. Carlos began instructing at Capt. Haggerty's school for dogs in 1968 and has worked with dogs ever since. He is also an accomplished groomer and a graduate of the New York School of Dog Grooming. Carlos has trained dogs for the obedience ring taking his own dogs through to Utility titles. He has also helped many clients title their own dogs as well. His grooming skills have enabled him to not only train his grooming staff but to groom many Portuguese Water Dogs to their breed championships. His areas of expertise include problem dogs, theatrical training, service dog work, conformation ring work and guard dog training. He is active in the community helping with fund raisers for the Animal Welfare League of Alexandria and has served on the League's board of directors for five years. Sandy began her dog training career at Capt. Haggerty's Schools for Dogs in 1973 after graduating from Hollins College with a BA in English. As a child she avidly showed her Irish Terrier in both the breed and obedience ring. Like Carlos she has put numerous AKC titles on her own dogs and helped her clients achieve their goals in the obedience ring as well. Sandy has developed a course for her instructors which she and Carlos have used to train countless dog trainers over the years. Many of their students and staff have gone on to be successful business owners themselves. 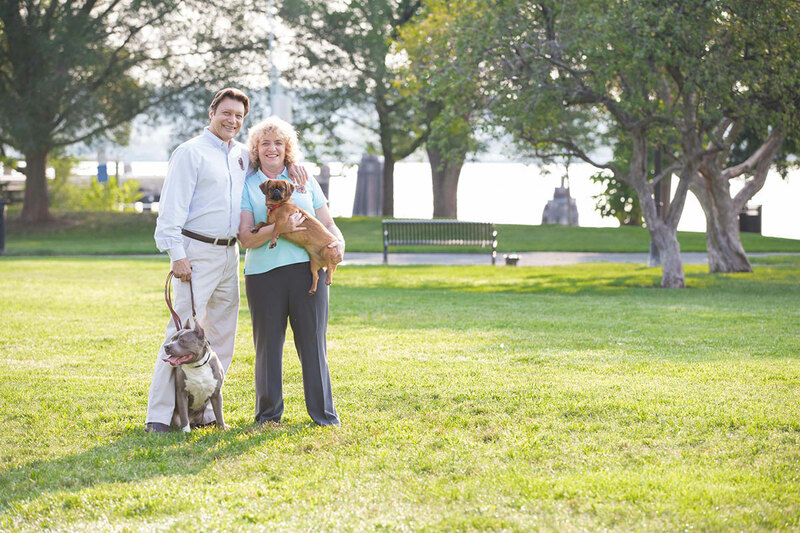 Both Carlos and Sandy have a special interest in service dog work and have trained numerous dogs for the disabled.